The former King Albert with Queen Paola. A 45-YEAR-OLD ARTIST who has long sought recognition as the daughter of former Belgian king Albert II has today launched fresh legal action to prove he is her real father as new details emerge about her origins. 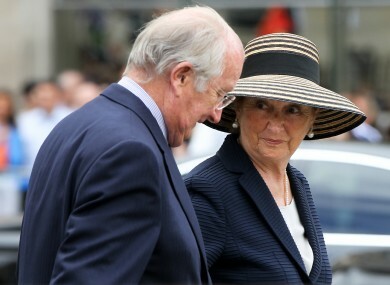 Lawyers said they would file new proceedings next week on behalf of Delphine Boel, who in June had tried to get Albert and two of his three children, Prince Philippe and Princess Astrid, to appear in court. As king, Albert enjoyed immunity from court action, but he then abdicated in favour of Philippe on July 21, citing age and ill health. Accordingly, Boel’s suit has been changed to name only Albert, 79, and her legal father Jacques Boel whose status will be contested so as to help establish her true paternity. Her mother is Jacques Boel’s former wife, Baroness Sybille de Selys Longchamps who, according to a 1999 book, had an affair with Albert in the 1960s before he became king. After the book came out, Albert appeared to acknowledge the facts when he remarked that his marriage had gone through “a crisis” some 30 years earlier. The king went no further, however, and has since made no mention of the crisis nor of Boel. Palace lawyer Guy Hiernaux said he had been instructed to “contest” the new action, saying that the relationship between Albert and the baroness did not “prove” paternity. Baroness Sybille has kept silent over the years but she is reportedly ready to provide fresh details in a special television programme to be aired later today and on Wednesday. Le Soir daily said that in the late 1960s, Albert’s affair with Baroness Sybille nearly led to his divorcing his wife Queen Paola but his late brother, King Baudouin, sought to prevent the split and the couple were reconciled. Email “Former king of Belgium (79) faces paternity court case”. Feedback on “Former king of Belgium (79) faces paternity court case”.